Admiral of the Fleet John Rushworth Jellicoe, 1st Earl Jellicoe, GCB, OM, GCVO (5 December 1859 - 20 November 1935) was a British Royal Navy admiral who commanded the Grand Fleet at the Battle of Jutland in World War I. His handling of the fleet at Jutland remains controversial. 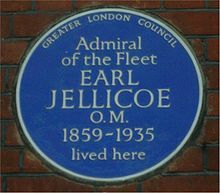 Jellicoe later served as First Sea Lord of the Admiralty, but he was removed by a new First Lord because of differences over policy and Britain's ability to carry on the war. Viscount Jellicoe served as the Governor-General of New Zealand in the 1920s. 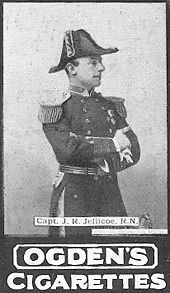 Born in Southampton into a seafaring family, Jellicoe joined the Royal Navy as a cadet in 1872 and was posted to HMS Britannia. He was made a midshipman on the wooden steam fully rigged frigate, HMS Newcastle in September 1874. He joined HMS Agincourt, flagship of the channel squadron, in July 1877. He then spent six months on HMS Alexandra, flagship of the Mediterranean Fleet, as signal sub-lieutenant. He was promoted Lieutenant on 23 September 1880. He specialized in gunnery and returned to HMS Agincourt in February 1881. As a Lieutenant from HMS Agincourt during the Egyptian war, he commanded a rifle company in the Naval Brigade at Ismailia and earned the Egyptian Medal and the Khedive's Bronze Star for this action. He was appointed to the staff of the gunnery school, HMS Excellent, as a gunnery lieutenant in May 1884. He was then awarded the Board of Trade Silver Medal in May 1886 on rescuing the crew of a capsized steamer near Gibraltar when on HMS Monarch as a gunnery lieutenant. He joined HMS Colossus in April 1886 and was then in charge of the HMS Excellent experimental department from 6 December 1886 to 10 May 1888. He was appointed assistant to the Director of Naval Ordnance later that year. Promoted to commander in June 1891, he joined the Mediterranean Fleet at Malta in HMS Sans Pareil in March 1892. However he was wrecked in HMS Victoria when it collided with HMS Camperdown (the Commander-in-Chief of the Mediterranean Fleet, Vice-Admiral Sir George Tryon's flagship) when the Admiral, 21 officers and 350 men drowned, off Tripoli on 22 June 1893. He was then appointed Commander of the new flagship, HMS Ramilies, in October 1893. Picture - Jellicoe as Captain, in command of H.M.S. Centurion, flagship on the China Station (his depiction on an a contemporary cigarette card shows he was in the public eye long before becoming an admiral). Promoted to the rank of Captain in January 1897, he became a member of the Admiralty's Ordnance Committee. 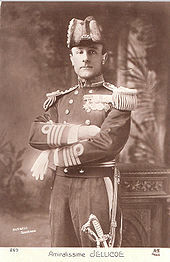 Jellicoe served as Chief of Staff to Vice Admiral Sir E. H. Seymour's during the Seymour expedition to relieve the Legations at Peking in June 1900. He was badly wounded and told he would die, but confounded the attending doctor and chaplain by living. He was appointed C.B. for services rendered during the Peking expedition in November 1900. He became Naval Assistant to Controller of the Navy in February 1902 and married Gwendoline Cayzer in London in July 1902. Having been decorated by the German Emperor with 2nd class of the Red Eagle, with Crossed Swords, in 1902, he became Captain of HMS Drake, part of the Cruiser Squadron, in August 1903. Under Admiral John Fisher, 1st Baron Fisher, Jellicoe was made Director of Naval Ordnance in 1905. He was appointed K.C.V.O., on occasion of the Review of the Home Fleet in the Solent by HM King Edward VII on 3 August 1907. He was also Aide-de-Camp to the King from 8 March 1906 to 8 February 1907. Jellicoe had been promoted to Rear-Admiral in February 1907 during his tenure as Director of Naval Ordnance. He pushed hard for funds to modernise the navy, supporting the construction of new classes of dreadnought battleships. Jellicoe became very knowledgeable about his profession, much more so than most of his contemporaries, especially appreciating the strong points of the Kaiserliche Marine (German navy). He supported F. C. Dreyer's improvements in gunnery fire-control systems, and favoured the adoption of Dreyer's "Fire Control Table", a form of mechanical computer for calculating firing solutions for warships. He was made Rear-Admiral and second-in-command of the Atlantic Fleet in August 1907 and hoisted his flag on HMS Albemarle. He went on to be a Lord Commissioner of the Admiralty and Third Sea Lord and Controller of the Navy in October 1908. He was appointed Vice-Admiral commanding the Atlantic Fleet on 20 December 1910 and hoisted his flag on the HMS Prince of Wales. He advanced to K.C.B. on the Coronation of King George V on 19 June 1911. At the start of World War I, 4 August 1914, Callaghan was prematurely put on the shelf by First Lord of the Admiralty, Winston Churchill. Vice-Admiral Jellicoe was promoted to Admiral and assigned command of the renamed Grand Fleet in Admiral Callaghan's place, though he was appalled by the treatment of his predecessor. Churchill described Jellicoe later as 'the only man on either side who could lose the war in an afternoon'. Jellicoe was in command of the British Grand Fleet at the Battle of Jutland (1916), history's largest (and only major) clash of dreadnoughts, albeit undecisive. His handling of the Grand Fleet during the Battle remains controversial, with some historians faulting the battlecruiser commander, Admiral David Beatty. However, Jellicoe certainly made no significant mistakes during the battle: based on limited intelligence, he correctly deployed the Grand Fleet with a turn to port, so as to "cross the T" of the German High Seas Fleet as it appeared. After suffering heavy shell damage the German fleet turned 180 degrees and headed away from the battle. Some critics claimed that he did not pursue the High Seas Fleet because he feared a torpedo attack, and overestimated the danger from a massed attack by enemy destroyers. At the time the British public were disappointed that the Royal Navy had not won a victory on the scale of Trafalgar. Picture - Bust in Trafalgar Square. Admiral Jellicoe was appointed First Sea Lord in November 1916, and turned over command of the Grand Fleet to Admiral David Beatty. His term of office in 1917 saw Britain brought within danger of starvation by German unrestricted U-Boat warfare. Jellicoe took a pessimistic view and declared that nothing could be done to defeat the U-boats. 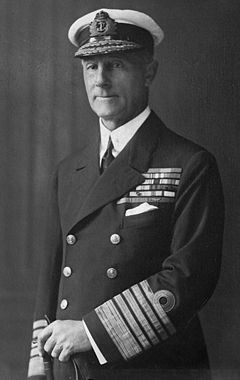 On Christmas Eve 1917, Admiral Jellicoe was rather abruptly dismissed as First Sea Lord by the new First Lord of the Admiralty, Sir Eric Campbell Geddes and was succeeded by Admiral Rosslyn Wemyss. Jellicoe was made a Viscount in 1918 and was promoted to Admiral of the Fleet in April 1919, along with David Beatty. Admiral of the Fleet the Viscount Jellicoe served as Governor-General of New Zealand from September 1920 to November 1924. On his return to England in 1925, he was made an Earl. 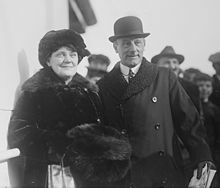 Jellicoe died in November, 1935 and his estate was probated at 13,370 pounds sterling. He was buried at St Paul's Cathedral. He was succeeded in the Earldom by his only son George, then styled Viscount Brocas. A bust of Jellicoe rests on Trafalgar Square in London, alongside those of Beatty and Andrew Cunningham, Admiral of the Fleet in World War II. A blue plaque stands on the wall of his house in Blacklands Terrace (25 Draycott Place), Chelsea, London. 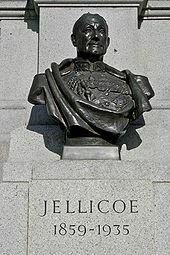 The junior boarding house at Bearwood College, Winnersh, UK, is named after Jellicoe. 14, Highbury Place, Islington, N.1. 39, Egerton Gardens, Chelsea, S.W. (dies there 20 November 1935). 12, Portland Terrace, Southampton (1909, an aunt, Miss Jellicoe). Vanity Fair, 26 December 1906. (MXLVI). (Men of the Day : 'Naval Ordnance', Captain John Rushworth Jellicoe, RN). Geoffrey Callender in The Dictionary of National Biography, OUP, 1949. Jellicoe, by John Winton, Michael Joseph, London, 1981. Andrew Lambert in The Oxford Dictionary of National Biography, OUP, 2004-7.